For a mild and gentle handmade soap with no color or scent, this is the best. This is a natural soap that is pure with excellent skin cleansing properties and gentle. Safe to use on babies, toddlers, kids or people with sensitive skin. Natural Unscented Handmade Artisan Soap is an excellent soap for sensitive skin. It has no fragrance or color. It cleans gently and thoroughly, but will not strip the skin of its natural oils or moisture. This is a mild soap for babies or anyone that prefers their soap just pure and simple. Unscented natural soap is made with oils like virgin olive, coconut and castor. It has natural beeswax for hardness and it’s superfatted at 7% to make it mild and gentle. 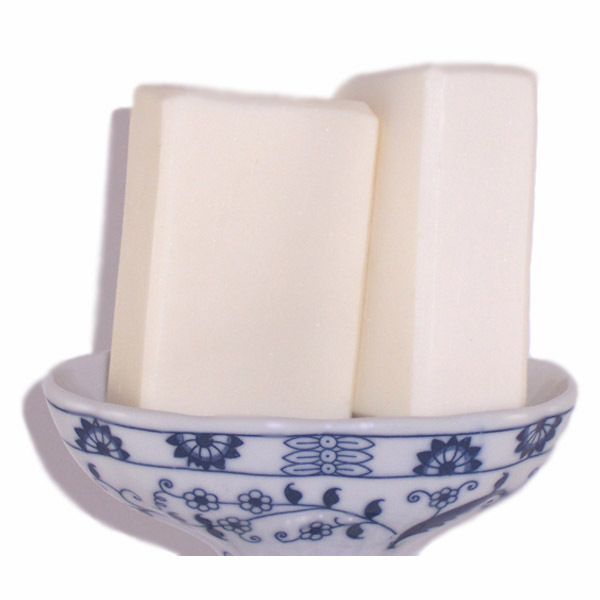 Unscented handcrafted soap has been enriched with mango butter. This soap is wonderful as a facial soap and safe enough for the whole body. The lather is silky and creamy. It won't dry out sensitive or dry winter skin, and produces a nice, creamy lather. This soap has been used on babies and adults that cannot tolerate too many ingredients. The main ingredient is pure, virgin olive oil which has been used to make soap for thousands of years. My handmade soap batches are cured for six weeks and hand cut. There might be slight variations in size and weight. This soap might look plain jane, but it’s so good for your skin. Each bar is individually wrapped in a soap box with a full ingredient label. Natural unscented soap makes a nice gift for a teacher, a birthday gift, a baby shower or anyone with sensitive skin. Each soap comes in a box and is ready for gift giving. Ingr: Virgin Olive oil, Coconut, Palm Kernel, Mango Butter, Castor oil, Soybean, Sodium Hydroxide, Beeswax.